1 of 1 Heat oven to 375 degrees . 1 of 1 In a medium bowl, combine cheddar, Monterey Jack, mayonnaise, cream cheese, pimento peppers, pickle juice, horseradish sauce and mustard; mix until well-combined. 1 of 2 In a small bowl, combine mayonnaise, honey and cabbage; mix until well-combined. 2 of 2 Heat a 12-inch nonstick grill pan over medium-high heat. Add bacon and cook 5 to 10 minutes or until crisp, flipping once. Drain on a paper-towel-lined plate. Pour off almost all of the bacon fat from the pan, leaving a very thin layer. 1 of 3 Combine the beef, country ham, salt and pepper in a large bowl. Handling the meat as little as possible to avoid compacting it, mix well. Divide the mixture into 4 equal portions and form into patties to fit the buns. 2 of 3 Using the same grill pan, cook the hamburgers over medium-high heat for 8 to 12 minutes, turning once, until internal temperature registers 145 degrees on an instant- read thermometer for medium-rare. 3 of 3 Meanwhile, place buns on a rack in the oven. Bake for 3 to 5 minutes or until lightly toasted. 1 of 1 Spread a generous amount of Pimento Cheese on the cut sides of the buns. On each bun bottom, place a thin layer of Honey Slaw. 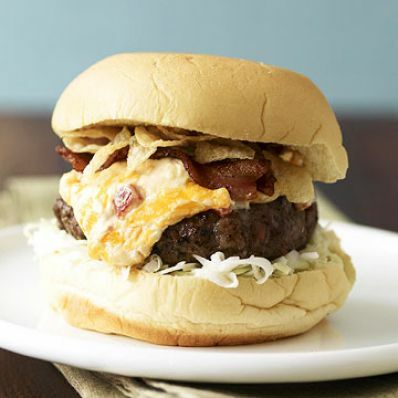 Top the slaw with a burger, 2 slices of bacon and crushed potato chips. Add the bun tops. Place the completed hamburgers on a nonstick baking sheet and bake in the oven for 1 minute. Serve burgers on warm plates.